For centuries, mythologies all over the world have portrayed flying humanoid creatures, greatly feared because their appearance seems to spell out death and destruction for those who are unfortunate enough to cross their path. Surprisingly though, encounters with these unnatural entities continue into modern times. Here, then, is my top ten list of the winged creatures that have most captured the public’s imagination in recent years. Undoubtedly the king of all flying humanoids is West Virginia’s Mothman—not only because there have been over a hundred reported sightings, but also due to the vast cocoon of strangeness from which it has emerged. The descriptions remain consistent—a tall, gray, headless, human-like form that features bat-like wings and enormous red glowing eyes. The monster seems to enjoy chasing motorists at speeds approaching one hundred miles per hour, and its appearance is linked to a tragic bridge collapse that resulted in forty-six deaths. While reports have diminished significantly since the 1960s, residents occasionally still whisper the name, which conjures up images of curses, strange lights in the sky, and visitations from mysterious men in black. 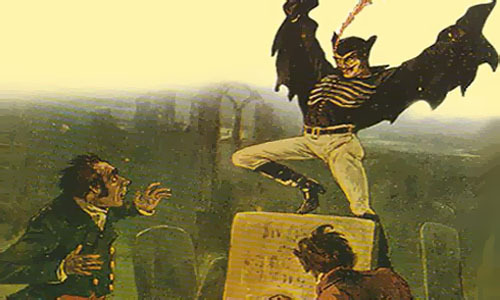 The Mothman’s British counterpart is Cornwall, England’s macabre Owlman, who has been seen frequently in the woods surrounding the Mawnan Church of England’s southern coast. Virtually all of the witnesses have been young schoolgirls, who have characterized the winged being as standing about five feet tall. Owlman is said to be covered in gray fur or feathers and apparently displays a horrific, beakless face with gigantic peepers and a wide, grimacing scowl. His feet resemble black, crablike pincers. Owlman has been observed hovering high up in the air or occasionally perched on the branches of large trees. Though there is only one documented account of the Houston Batman, it is a memorable one. The unearthly figure was spotted by three residents of a Texas neighborhood one evening during the summer of 1953. Hilda Walker, Judith Myers, and Howard Phillips all stated that the tall entity was adorned in a dark paratrooper’s uniform, and that the Batman appeared to display attached wings. After a few moments, the apparition vanished from their sight, and his departure seemed to coincide with a torpedo-shaped object that shot up into the sky. In the early part of 2004, Monterrey, Mexico news outlets were buzzing with the story of a young police officer named Leonardo Samaniego. Leonardo’s patrol car had apparently been attacked by a humanoid that he described as a flying witch that was adorned in a black, hooded robe. The hideous, dark-skinned hag had floated out of a tree, according to Samaniego, and had displayed razor sharp claws, as well as large, black, lidless eyes. Her appearance and behavior were so shocking that the poor officer lost consciousness until other emergency workers responded to his initial call for help. By the time others had arrived on the scene, the “bruja” was nowhere to be found. he began to accost solitary, young women by ripping at their clothing with steely claws while he breathed noxious, blue flames into their faces. To this day, no one is sure of Jack’s true identity, nor from where this notorious scoundrel came. 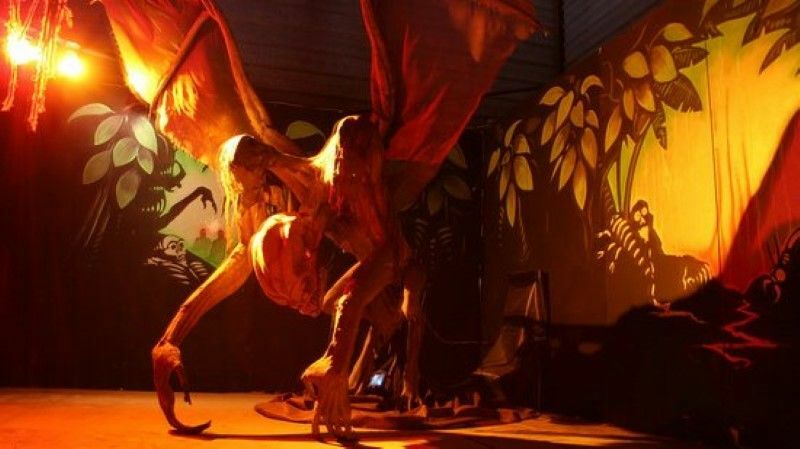 During the early part of the twentieth century, the little town of Van Meter, Iowa was visited by a towering, gargoyle-like creature with massive wings and a single glowing horn that emanated from its forehead. According to newspaper articles from the time, several concerned citizens fired shotguns at the monster, which emitted a horrifying shriek and left a sulfuric smell in its wake. It was last seen disappearing down an abandoned mineshaft, and curious tracks were found where the thing had been romping about. Three Marines who were standing guard duty on the roof of a bunker during the Vietnam War sighted a creepy female entity flying overhead late one night. Based on their descriptions, the modern-day harpy was all black, with long flowing hair and leathery wings. When the bird woman passed right above the shaken soldiers, they were able to discern that her arms were flaccid and rubbery, and that she seemed to be encased in a dull, greenish glow. soaring through the air. But, a father and son near the town of Holmen claimed that they encountered a monstrous, bat-winged figure on a remote road one evening during 2006. As the screeching abomination dive-bombed the windshield of their pickup truck, the men were able to make out some unnerving details, including the fact that the humanoid had a mouth full of sharp teeth, as well as a protruding rib cage. Shortly after the incident, both men became violently ill. While the forests of Washington State are said to be inhabited by giant, hairy bipeds commonly called Bigfoot, there is an account from 1994 that seems to indicate a winged variety of these legendary man monsters. When young Brian Canfield’s automobile died on a remote mountain road one evening, he was understandably distressed. But the true nature of his situation took a dramatic turn when a towering, winged creature descended from the sky in front of him. Brian later related to officials that the ostensible ogre was covered in blue-tinted fur and displayed a wolf-like head, in addition to yellow crescent-shaped eyes. Fortunately for Brian, the unwelcome visitor departed as swiftly as it had arrived. Barrens for centuries. The chimeric hobgoblin is worthy of inclusion on this list, due to its alarming nature and reputation. Descriptions of its appearance are fairly consistent—a kangaroo-shaped body with bat’s wings, in addition to a horse-like head and forked, reptilian tail. The Jersey Devil is believed to have been the thirteenth spawn of a cursed female resident, and its many appearances during the winter of 1909 resulted in mass hysteria throughout the region.